Gourmet Rooftop. This Hotel is indicated to all guests looking for relax with style. However with the possibility to do several activities sport or leisure and enjoying the evening entertainment in an absolutely unique setting. The Villa Del Parco is located Santa Margherita di Pula, in the heart of Forte Village Resort, at 45 km from Cagliari Airport, an exclusive resort set in 47 acres of pine forest. A piece of exclusive Paradise that enjoys a sandy beach and crystal clear sea water in Southern Sardinia, between Pula and Capo Spartivento. Lush green surroundings help you rediscover your inner perfection. This is how days are spent at Villa del Parco & Spa, a 5-star luxury hotel with elegant rooms and bungalows. One day here at the Villa del Parco could be like this.... start with a rich breakfast in the shade of the exclusive patio, after pamper yourself in the thermal waters of the top class Acquaforte Spa and dine by candle-lights beneath the moonlight on the rooftop terrace of the Belvedere Gourmet restaurant. 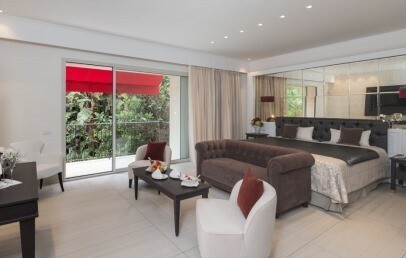 Guests staying at Villa del Parco & Spa have a direct access by a short walkway to the Acquaforte Spa. Moreover a beautiful private Villa can be booked: Villa Lavinia – All the rooms of this beautiful two-storey villa are furnished with style and with all luxury amenities. A large private garden and an exclusive outdoor swimming pool with hydro-massage and colour therapy belongs to this Villa. On request the Villa can be divided into two independent Suites and the garden and pool are at exclusive use of the guests of the Suite on the ground floor (prices on request). All the rooms and bungalows of the Villa del Parco & Spa have been completely refurbished and offer now an absolutely modern and luxury design. All accommodations are dipped unter the pinewood and offer either a patio, the one located on the ground floor, or a balcony, located on the upper floor. All offer a lovely garden view. The marble bathroom has either tub and separate shower or tub with shower head. They are complete with all mod-cons as air-conditioning, LCD television with satellite channels, DVD player, minibar and safety box. Some of the rooms and bungalows can be booked with interconnecting door and it is possible to add a third bed or cot (upon request and availability). The Wellness Centre is surrounded by a luxuriant garden, where the wonders of Sardinian nature contribute to the pleasure and relaxation of guests. In this paradise full of marvels you may, for instance, absorb energy from the six seawater pools at different temperatures. Each provides a different emotion, ranging from the intensity of sea oil to the velvet of aloe. Just like a flower, your wellness will blossom anew. A team of experts will be at your full disposal, at a Spa of great refinement and luxury, to lead you along a personalised course including a range of top quality treatments: discover everything the most famous Wellness Centre in Sardinia has in store for you. Upon booking you may request to our booking assistants further information about all the available packages at Acquaforte Spa, it will be our pleasure to advice and book for you the best treatment that will complete your wellness holiday package. Spa subject to an entrance fee. Guests will enjoy a refined breakfast at the exclusive "Patio" at the Villa del Parco & Spa and for dinner time the beautiful Belvedere Gourmet Rooftoop, located at the top floor of the Villa with à la carte menu and nouvelle cuisine. Spacious and luxury double room located on the ground or 1st floor in a small buildings in the park. 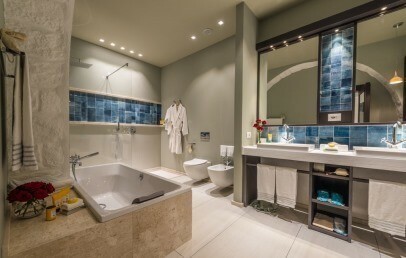 The private bathroom is in marble and has a tub and a separate shower or only some with tub-shower as well as hairdryer and courtesy set. The rooms on the ground floor offer a patio, while the rooms on the 1st floor a balcony. The external areas are comfortably furnished and are an ideal place to enjoy breakfast and spend time to relax. Upon request and availability some of the rooms and bungalows are interconnecting. Upon request it is possible to add a third bed or cot.